Teradek (Booth C5725) has introduced the Ace 500, an affordable zero-delay wireless video system for budget-conscious videographers. Built with the same reliable wireless technology found in the industry-standard Bolt product line, the Ace 500 offers an ultralight, streamlined experience at a more accessible price point. Teradek Ace 500 allows users to transmit and receive video from any Teradek Bolt 500 or SmallHD FOCUS 500 transmitter/receiver. 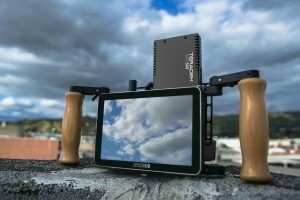 “Ace 500 was designed for independent creatives beginning to incorporate wireless video into their workflows or for those operating within strict budgets who still need a reliable video link,” explained Greg Smokler, VP, products, Teradek. Ace 500 transmits uncompressed 1080p60 video up to 500-ft. line of sight with less than 1-ms delay. The units feature HDMI input/output and can be powered via the 3.5-mm barrel input using either a PTap/2-pin power source or one of several battery-plate accessories available. The Teradek Ace 500 will be available in mid June, and a transmitter/receiver set will retail for $999.